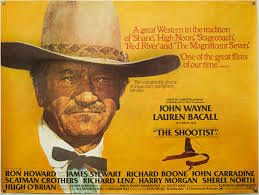 Earlier, I was flipping through the channels and landed on The Shootist, John Wayne’s last movie. It is not my favorite, but, since it is the Duke’s final film, I have seen it several times. I guess that means I do not have this one memorized like a bunch of the other ones. Despite it not being a favorite, The Shootist has some good parts. James Stewart makes a cameo and having him in a movie is always a good thing. Ron Howard also appears during his transition from Opie Taylor to Richie Cunningham to famous director. Lauren Bacall shows up as Bond, a character named in honor of Ward Bond. The movie has some good scenes and some good lines, but the ending always gets to me. Perhaps, it is because I know that it is the last time John Wayne appeared on film. The movie is about an era coming to an end and, although they did not realize it, the movie also marks the end of a career. I have always wonder about the actors who took part in that final shootout. In the years that followed, did they think about that scene? Did they feel honored to be part of it? Did they care? In short, John Wayne sets up one last gunfight with three people who would like to kill him. Richard Boone was well-known as Paladin on Have Gun, Will Travel and had been in a bunch of movies, including John Wayne’s Big Jake. Hugh O’Brian played the title character in The Life and Legend of Wyatt Earp and had a bit part in In Harm’s Way with John Wayne. Bill McKinney, a native Tennessean, accomplished something that could be unique. He was killed in the movies by John Wayne and Clint Eastwood. The final scene in The Shootist did not work out for him, and, earlier that same year, he played Captain Red Legs Terrill in The Outlaw Josey Wales. Each one of those actors could challenge John Wayne in a gunfight, but, in true Duke fashion, they could not do him in. Instead, he was shot in the back by the bartender. That is the whole point of this post. Who was given the role of shooting John Wayne in the back? Who killed John Wayne in his final film? 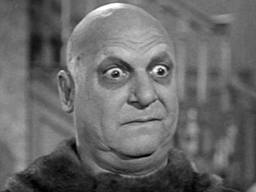 After an extensive search, I discovered that the role went to an uncredited actor named Charles G. Martin. He had sixteen acting credits, and The Shootist was also his last movie. Unfortunately, more information was hard to come by. I found no pictures and little about his life. He was born in Arlington, Texas in 1912 and passed away in Sarasota, Florida in 1998. If anyone knows more about Charles G. Martin, then I would be interested to read about it. I picked up another magazine. This one was put out by the good people at Globe and is called Shocking Secrets of America’s Favorite TV Shows of the 50s and 60s. Short title. I figured it would be filled with juicy tidbits about the television stars of yesteryear, but it was actually filled with stuff that I already knew. For example, Andy Griffith was difficult to work with. As an ardent fan of his show, I knew that. Heck, he even wore a cast in a few episodes after he put his fist through a wall. 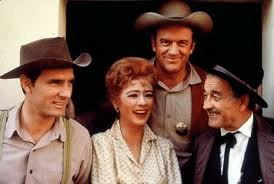 I found out that one actor on Gunsmoke walked with a fake limp while another one had to hide a real limp. Of course, everyone knows that Dennis Weaver was faking it as Chester, but I had no idea that James Arness couldn’t walk that well. I also found out that three of the Cartwright’s wore hair pieces, and the other one wore stacked shoes. Bonanza will never be viewed the same. Anyway, I thought that I would share some other “secrets” of the oldies. I’ll narrow it down to the shows that I have seen more than once. The Honeymooners – A lot of drinking went on. Hey, it was Jackie Gleason. He liked a good time. You Bet Your Life – Here’s a shocker. Groucho Marx liked women as well as the Secret Word. I Love Lucy – Fred and Ethel hated each other. The Munsters – In real life, Herman Munster went to Harvard. was married to this woman. My Little Margie – I had to watch these reruns because it was my mom’s favorite show. It turns out that Margie liked the sauce. Davy Crockett – Walt Disney wouldn’t let Fess Parker play a role in The Searchers. This is one that I actually found interesting. Gunsmoke – Here is where a scandal really hits. While everyone was waiting for Miss Kitty to hook up with Matt, she was hooking up with Doc behind the scenes. Have Gun, Will Travel – Paladin was one of television’s coolest characters, and Richard Boone was pretty cool, too. Unfortunately, that cool lifestyle of drinking killed him. The Andy Griffith Show – This is one thing that I didn’t know about my favorite show. It was pre-empted by the debate between Richard Nixon and John F. Kennedy. Hogan’s Heroes – Everybody knows about Bob Crane. The Monkees – Charles Manson auditioned to be a Monkee. There is a lot more, but you’ll have to buy the magazine for that. It’s the least I could do for the good people at Globe.